thisismyrobot: Sending you next robot to Antarctica? Sending you next robot to Antarctica? Well, maybe not Antarctica, but somewhere with a 0-50°C (32-122°F) temperature range? Plat'Home from Japan has just announced the release (in North America) of their OpenMicroServer. 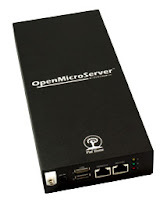 The OpenMicroServer has an AMD 400MHz processor, three network ports, 8-bit DIO, RS232, 2xUSB2.0 and a CF slot. More specifications available here. Now, with the addition of a usb-attached IO board, this could form the basis for one hardy robot! Let's just hope they ship to Australia.